Standalone Windows programming software available for download. A professional yet compact USB PIC Programmer offering a 20-pin ZIF (Zero Insertion Force) socket for easy programming of most Microchip PIC Flash devices that do not require Low-Voltage Programming. This PIC Programmer uses a convenient USB port for connection to the computer as opposed to the traditional Serial port, therefore eliminating the need for a separate power supply as power is taken directly from the USB port. 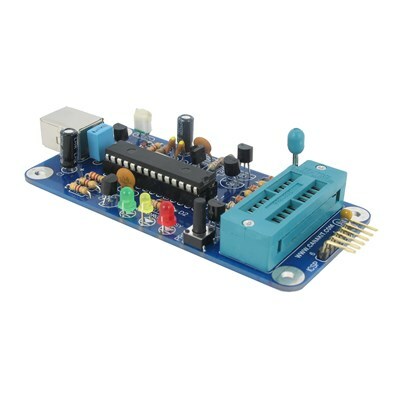 The PIC Programmer also offers In-circuit programming through a standard 6-pin ICSP connector as well as a built-in 20-pin ZIF socket for easy programming of most PICs of up to 20-pins right on the programmer. The PIC Programmer is 100% compatible with PICkit 2 interface, with the added advantage that it incorporates a ZIF socket for easy insertion and removal of the PIC and therefore can be used as a production programmer as well as an experimental programmer. It is also fully compatible with Microchip's MPLAB IDE software and therefore can program most popular PIC Microcontrollers. The firmware of this programmer is fully upgradeable as new devices are released and updates to the firmware can be easily downloaded via Microchip's official website.